I don’t want to sound mean, but I felt the last book I read about the Holocaust was more pandering than storytelling (odd, considering the title of the book). After reading that, I needed something with more meat. Boy, did I get it. 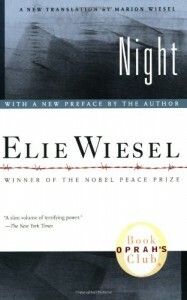 Nobel Peace Prize winner, Elie Wiesel, wrote a walloping book in ‘Night’. Atrocities and suffering began around page three and didn’t let up until the end. Page after page presented new ways to inflict pain and torment. The pages were few in number, but mighty in weight. Anyone wanting to understand what happened in and around Auschwitz needs to read this book. I’ll go to say that this book should be required reading for every history student, both in and out of school. We owe it to ourselves never to forget this story. I’m struggling with giving this book—no doubt a masterpiece—a rating. Night deserves of all the awards and recognitions. However, I did not enjoy myself while reading it. I suffered through each difficult word. 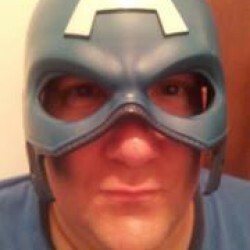 Because of that, I cannot stand on the hill and wave the five star flag. Yes, you must read this book, but I rate it four stars.